Why did I graft a Welcome Program on to my Marketing Management System? Recall my Home example from Eddie Bauer? Our analysis showed that Home customers "added on" to a first purchase within a few months of a first Home order. And then ... the Home customer went dormant. That makes sense ... you don't buy Home products on a monthly basis, do you? So by combining an Acquisition Program and a Welcome Program, we helped the Home division have the best year in their history at Eddie Bauer way back in 1999. The idea kind of got away from me for maybe fifteen years. Then I saw the program implemented by a B2B brand. Holy cow! This company leveraged outbound calls to first time buyers. Special email programs designed only for first-time buyers. Personalization based on the merchandise purchased in a first order. All of this stuff blended together into a tasty bowl of Welcome Program Soup!!! Regardless of client, the most impactful timeframe in the development of a customer is in the first three months following a first purchase. Just like that, my worldview was changed. The Welcome Program became an integral part of my Marketing Management Program. Awareness = Duluth Trading Company. Acquisition = Jim Fulton and Eddie Bauer Home. Welcome Program = Eddie Bauer Home, B2B Brand With A Great Program. See how all these diverse topics interact with each other? You graft ideas on to your own Marketing Management System, and before you know it you have your own way of doing things, your own program, your own system. That's what the New Marketing Leader needs to sell to all employees when taking over a marketing department. Then the New Marketing Leader needs to execute well, correct? It's 1995, and I'm sitting in the office of a person named Jim Fulton ... at the time he was the Marketing Manager of the Kids Division at Lands' End. In the early 90s at Lands' End, we had what I coined "Battling Business Units". Each business unit (Kids, Home, Mens Casual, Mens Dress, Womens Casual, Womens Dress) battled for the love of the same customer. Each business unit mailed the same customer ... grossly overspending to trade dollars back-and-forth between Battling Business Units. This caused Lands' End to be less profitable than it could be. So again, I'm sitting in Jim Fulton's office ... he has thousands of lines of custom SPSS code that create multi-year customer forecasts. To be fair, he borrowed the forecasting idea from a company called Fingerhut, a company who had comparable reporting in the mid 80s ... if I remember correctly, their forecasts were called "Nameflow Models". He shows me one of his findings ... he shows me that if a "Battling Business Unit" wanted to optimize profitability when housefile spend was sub-optimized, the Battling Business Unit could excel at Customer Acquisition. In other words, if everybody was Battling for the same customer, a Business Unit could help the overall brand by finding new customers that fed the entire ecosystem. And he had thousands of lines of code to create the simulations that proved his point. Did anybody listen to this person? Absolutely not!!! Later that year I landed at Eddie Bauer. Once I got through the Byzantine structure of having to access data on a mainframe using COBOL, I created my own Forecasting algorithm. Once I had my own Forecasting algorithm, I (too) learned just how critically important Customer Acquisition was to a business. I got to test my theories three years later. When I became Circulation Director at Eddie Bauer, I became responsible for the plan for the Home division. Home customers had low annual repurchase rates (25% - 32%, +/-). It didn't matter how many times we mailed these customers catalogs, they weren't going to buy anything. So I changed strategy. We created lean, thin catalogs with best merchandise, thereby increasing the productivity of the catalogs. Then, we shifted Circulation out of housefile mailings and instead focused on two key areas. Customer Acquisition (specifically Pottery Barn customers). The Three Months following a first purchase (more on this tomorrow). Within a year, the Home division was growing and had the best year of profit in the history of the division. Looks like Jim Fulton was right ... and while his ideas weren't embraced at Lands' End, his ideas were grafted on to my Marketing Management System, allowing the Home division at Eddie Bauer to have the best year in their history just four years later. So far, we've covered three elements within the Great Eight. Audience (via my boss, the CMO at Nordstrom). Awareness (via Duluth Trading Company and a groaning audience at a conference). Acquisition (via the Customer Acquisition Simulations created by Jim Fulton). I might talk about the Great Eight as if it were my idea ... but that's not true. I grafted ideas from smart people on to my own Marketing Management System. Tomorrow we'll talk about Welcome Programs. I presented a paper at a conference. I referenced the fact that you can't get away from Duluth Trading Company advertising. And it's somewhat true ... the target TV-watching audience can't get away from it!! As I shared examples, I could tell that the audience wasn't on my side. You know this feeling if you are a presenter ... you hear groans, you see people shaking their head back-and-forth to simulate a "No" motion. You see people whispering to other people ... "he's an idiot and my company paid for me to listen to this joke of a presenter". Ok, that didn't happen. I don't think it happened. Whatever. I paused, then mentioned to the audience that I could tell that they "hated" Duluth Trading Company. The "no" motions changed to "yes" motions. I asked the audience why they hated a company that tripled in size in the past decade while leveraging catalog marketing, the very tool that the audience loved. One person volunteered an answer. "Their advertising is stupid. They assume that men are dumb fat morons." What does that comment really mean? It means that the person who said the comment was not part of the Audience that Duluth Trading Company targets, and it means that the form of Awareness (TV ads) did not align with the preferred Awareness technique advocated by the Professional (Catalogs). In modern marketing, Audience / Awareness / Acquisition is all part of what is called a "Marketing Funnel". The person at the conference preferred tactics (boring catalogs) that were further down the funnel, tactics closer to the sale process. For me, Awareness became important late in my career. Even though examples were all around me for five decades, I was blind to the importance of Awareness until I saw Duluth Trading Company excel at Awareness. Then it clicked. Now I'd advocate spending money in ways I'd never have advocated through most of my career. I grafted the lessons of Duluth Trading Company onto my Marketing Management System. I don't care that the majority of my readers don't like what they do ... if anything, it should motivate my audience to do something unique and clever on their own ... creating their own Awareness programs, right? My Marketing Management System relies on thorough knowledge of your core Audience. I can remember the moment when Audience became important to me. I was sitting in the office of my boss ... she was the Chief Marketing Officer. My company (Nordstrom) was about to shut down the catalog division. I was trying to defend the rural customer in North Dakota who didn't have access to a Nordstrom store, a customer who adored the merchandise offered in the catalog. When the catalog went away, the merchandise offered in the catalog was also going to go away. Those customers, customers who loved the catalog, were not going to be served anymore. I wanted my boss to have a solution for these customers. "We don't want those customers. We have plenty of market share that we can earn from our core customer audience." Oh, I was angry. "We don't want those customers???" It wasn't the first time my boss told me she didn't want customers. How could she possibly not want customers? The key word, of course, was "those" ... as in "those customers". Customers who were outside of our Audience. My team prepared reports that showed we only captured "x" percent of the wallet of our core audience. The Management Team decided that it was better to try to earn more spend from our core Audience than it was to cast a wider Audience net. My boss (as usual) was right. She knew her Audience. She defined the Audience for the rest of the company. And she was able to get those customers to spend more (something I had not previously observed). The vast majority of my client base does not understand who their Audience is. Oh, they give answers ... "she's a convenience shopper". But they don't define the Audience, they don't define what the Audience spends, and they don't define how much of that spend they can earn. If your audience is "Fashion Forward Women earning $100,000 a year or more in Suburban or Urban areas" and you know these women spend $7,500 a year in your wheelhouse and you are already capturing $500, then you know that you have just under 7% of the share of wallet of your core customer. You have room to grow. Now you implement programs within the remainder of the Great Eight to get 10% of the share of wallet of your core customer. Mind you, you aren't trying to get the customer to spend more ... the customer CANNOT spend more. But the customer can reallocate. You want dollars that go elsewhere. So that's the moment in my career that Audience became important. When in your career did the idea of "Audience" become important in your Marketing Management System? Early in my consulting work, I visited a company. This company hosted a day-long strategy session. My job was to present customer findings, helping the merchandising and marketing and creative folks understand why customers were not achieving their potential. After I shared my findings, the Marketing Professional gave a presentation about the future of marketing at that company. I prepared myself for an hour-long discussion of the innovations this person planned on implementing. The presentation lasted maybe 10-15 minutes. The Marketer essentially read from a white paper from a research brand, and even with that level of corporate malpractice the Professional sampled ten points of nonsense down to one point that he planned on implementing in the upcoming year. It was the most tepid presentation I've witnessed in the twelve years I've been a consultant. The Marketing Professional did not have his own system. He was reliant upon a third party for ideas. He had no confidence, no answers ... he had no clue. The research brand he paid, however, they knew how to monetize his lack of confidence. 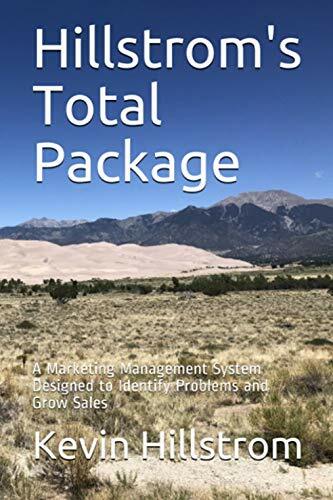 The New Marketing Leader must have their own system ... a set of practices and concepts that seamlessly fit together and have been used previously to generate success. The New Marketing Leader communicates the system with enthusiasm, causing skeptical co-workers to buy into the system. Tomorrow I'll address areas in the Great Eight, sharing with you the moments over more than three decades in my profession that shaped the system I advocate. Now, if you are a sports fan, this article (click here) will prepare you for what is coming ... in particular, the article discusses "grafting" ideas on to a solid foundation. That's what I'm looking for from you, the new Marketing Leader. In football, pro teams liberally borrow from colleges, and colleges happily borrow from high schools. Read this article for details (click here). I arrived at Eddie Bauer in the mid-1990s. The marketing team had a group that performed competitive analytics. An analyst straight out of college waltzed into Gap and documented everything Gap at Bellevue Square did, in plain sight. Promotions. Floorset changes. Pricing of key competitive items. I recall the times the Store Manager saw our analyst coming and banned him (and his camera) from the store. I also remember the times when the young analyst lined up a conference room with the promotional strategies used by all of our competitors. He had the blueprint, the DNA of every company on the wall. We borrowed the stuff that fit with our way of doing things. I frequently talk about the Great Eight. A key element of a credible Optimization Program includes borrowing from others. If Stitch Fix uses regression and neural networks to determine what a customer is likely to purchase next, and you compete against Stitch Fix, then you have every opportunity to liberally borrow their ideas and import 'em into your Marketing Management System. It doesn't guarantee that the ideas will work, but it most certainly guarantees that you'll come up with a Marketing Management System that is unique and fully your own. As a new Marketing Leader, the last thing you want to do is fail because you clung to the failures of your predecessor. Borrow from others. Combine what they do with what you do best. Allow your own Marketing Management System to evolve and thrive. Teach your ideas to everybody who will listen. A few days ago I told you a story from my time at Eddie Bauer. As the new Circulation Director, it didn't take long for the problems of the prior Leadership group to be pinned on me. That's the way the world works. By mid-September the Green Bay Packers might get off to an 0-2 start. Even though the new coach will largely coach players from the failed regime, the 0-2 record will be his fault. If you are going to be blamed for an 0-2 start, at least be blamed for doing things your way, right? The same logic works for you, the New Marketing Leader. Why should you be blamed for things that your company did a year ago, things that were so lousy that it caused you to earn your new job as a Leader? And yet, we see this happen all the time. In catalog marketing, the New Leader comes in and keeps mailing the darn catalogs ... same in-home dates, same circulation levels, same vendors, same geeky math. In e-commerce, it's the same boring five emails per week, not personalized, blasted to the same customers expecting 40% off plus free shipping because you've sent the customer more than a thousand of these over the past four years. Do that and you'll start off with an 0-2 record ... and then the problems are your fault. Do you want the problems of the old regime to be your fault? You are a New Marketing Leader. Chart a new course. Your course. Don't continue doing the same darn stuff that got your predecessor fired. Have a Marketing Management System in place on Day One, a system fully unique to you. If you are going to fail, fail your way. If you are going to succeed, get the credit you deserve. My football team is the Green Bay Packers. They have to be my team ... I grew up 35 miles from Lambeau Field. My team completed back-to-back 7-9 and 6-9-1 seasons. The former head coach was fired in December ... Super Bowl winning head coaches are seldom fired, but then again, the last time the team was this bad e-commerce didn't exist (1990-1991). The new head coach isn't even 40 years old. He comes from a coaching tree that produced the past two NFC Champions. He's never been a head coach, he only called plays for one season, and yet he's been given the keys to Aaron Rodger's car. When a new coach is hired, the new coach brings in a new style ... in this case, a new offense. Articles are written, research is done, and we end up having a "feel" for what the new coach is likely to do. You look at how the Redskins played in 2012, how Atlanta played in 2016, how the Rams played in 2017, and how the Titans played in 2018. Elements of those offenses are likely to become the new Packers offense. The new coach hired his staff. In April, the team will draft new players, and come July the pieces all fit together. In early September, we'll begin to see what the new team looks like. This Spring is filled with New Marketing Leaders. You folks are giving your brands a new start. Your co-workers are looking at you, trying to figure out what "system" you bring to the table. Are you going to do things they way they've always been done? What "newness" are you bringing to the table? What is your secret to increase sales and improve profitability? Are you going to employ the old, stale "omnichannel" strategy that doomed so many retailers? Will your focus be digital, and if so, how will you employ mobile and social and Google and Facebook (yes, social and paid ads on Facebook are fundamentally different)? You better darn well have a marketing system in place, right? There should be a plan for each of the eight areas of study. And you should know what your plan is as close to day one as is humanly possible. There's no guarantee that you'll succeed ... or fail. You might be brilliant and fail, you might be a dimwit and luck into wild success. But if you have a plan, from day one, a system that is all your own, you'll have better odds than other new marketing leaders. Have a plan. And for goodness sake, implement your own system ... something only you do, something that is fully unique to the skills only you possess. Yesterday I told the story of the birth of "Merchandise Productivity" and "Marketing Productivity". Those concepts evolved significantly, especially once I began doing consulting work and had to ferret-out the real reasons (merchandise and new customers) businesses were failing. As a New Marketing Leader, you are typically being thrust into a bad situation. If your brand was "winning" it would not be making changes. So you need to chart your own course ... you know what you should do, you know what is likely to work and not work ... and yet, you've got a ton of co-workers who have expectations of you ... their expectations. They don't know anything about marketing, but they have strong ideas about what you should do, nonetheless. And if you don't do what they expect you to do, you're a moron!! So you need to set expectations from Day One. There's nothing wrong with soliciting advice from your merchant, inventory, tech, and creative partners. Go ahead and let the Operations Director tell you what she heard about at a Woodside Research conference. 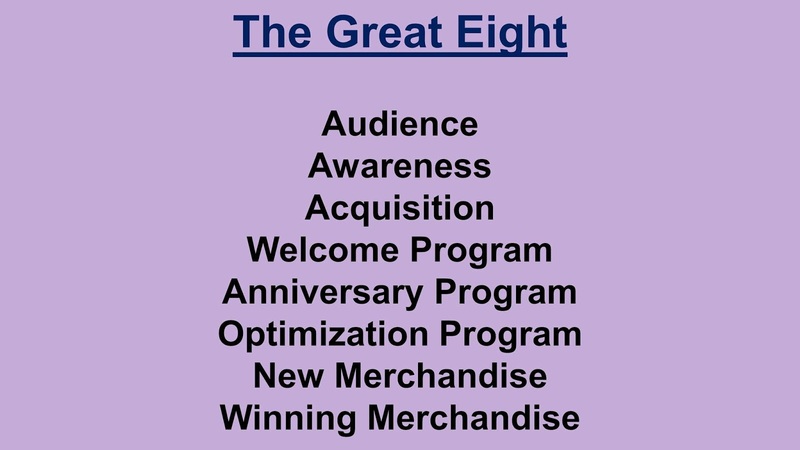 Then, after soliciting advice, craft your plan for your brand using The Great Eight above. Take their ideas, and repackage them based on what you know needs to happen. Communicate to all what you are going to do via each category above. 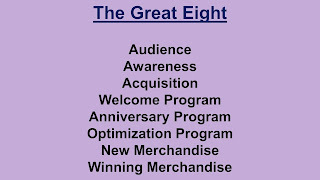 Then get busy ... and when somebody has an idea to increase conversion rates by 30%, fit the idea into The Great Eight, where the idea likely falls into the "Acquisition" category or the "Optimization Program" or "Winning Merchandise". Turn the tables ... put the responsibility for the increase on your co-workers. Set expectations from Day One. Use The Great Eight to structure plans and discussions. The transition from analytics to business can be a rather spicy endeavor. Back in January 1998, I changed jobs. No longer was I an analytics dork with a greaseboard full of requested queries in prioritized order ("Please tell us how many customers who responded to our Family & Friends offer also purchased denim, priority is 9 of 10, k thx") ... nooooo ... I was now a dork who thought I could actually run something. And Management listened to me! Just like that, I was the Director of Circulation. Pay raise. A team of a dozen people. We had quarterly meetings with the Leadership of our catalog (and budding online) division. Business was AWFUL. I spent the first three months in my job figuring out how to liquidate merchandise in any possible way without "damaging the brand". On the surface, you'd think that was possible. In reality, the reason you are trying to liquidate without damaging the brand is because the brand has been damaged by lousy merchandise. Eddie Bauer loved planning. LOVED. IT. A month into my job and I'm planning Spring-Summer 1999 (it was February 1998). This means I had to use current-day performance to predict business performance fifteen months out. This meant I forecasted future performance would be ... wait for it ... wait for it ... awful! Naive, I waltzed into this meeting and presented my catalog/online division plan for Spring/Summer 1999 (in February 1998). I expected this team of thirty business leaders to adore my vision, respect my precise forecasting ability, and embrace my immaculate spreadsheet calculations. Yes, blame for business that would not yet transpire for fifteen months was my fault! The Chief Merchandising Officer was particularly offended with my wizardry. "Our assortment next Spring will be trend-right and brand-appropriate. How could you torpedo us like this?" The next comment came from our CEO. "Kevin, what are YOU going to do to fix the business? What is the sales lift you are willing to sign up for??" Strong hint - I was never going to sign up for a sales lift, given bad trends. But I might sign up for increases based off of improved merchandising, if somebody could demonstrate to me that the productivity of the merchandise had improved. That's where the concept of Merchandise Productivity was born. The reason my plan for Spring/Summer 1999 was so awful wasn't because I was sinking the business into oblivion (at least I don't think it was) ... it was because customers hated our merchandise and the last thing I was going to do was forecast a 15% sales rebound and then have inventory bought to my level of optimism and then have to liquidate all over again without "damaging the brand". I had three months before the next big meeting. In this time, I had to come up with a formula that allowed each team to "sign up" for the sales lift they promised. And I had to do this in a fair way without causing false gains that would result in more liquidation opportunities. Step 1: Our Inventory Director (not the merchants) would optimize the page count for each division within a catalog. If we had 48 pages of Mens, and Mens only deserved 40 pages, she authored 40 pages. I then calculated the productivity of 40 good pages vs. 40 good pages and 8 awful pages. Let's say this resulted in a 10% increase in demand per thousand pages circulated. The 10% increase was what the MERCHANDISING TEAM signed up for. Mind you - not one merchant did anything to cause this ... but we had to come up with a way to fix the business without expecting the merchandise to ever improve. Step 2: When the Inventory Director achieved a 10% increase in demand per thousand pages circulated, I was able to circulate deeper. So I'd do just that ... I'd mail more catalogs. The incremental gain in demand from the additional catalogs mailed was attributed to MARKETING PRODUCTIVITY ... even though we didn't change marketing strategy one bit!! This frequently caused a +/- 5% demand gain. Again, there's no change in merchandising strategy, there's no change in marketing strategy, there's no change in creative strategy. There's the Inventory Director manipulating pages to make catalogs more productive, and there's the Circulation Director mailing more catalogs because crappy merchandise isn't allowed in the catalog so I can mail deeper. This made the thirty-ish Leaders in the room very, very happy. Marketing and Merchandising were doing something to fix the business. The business was never fixed. True merchandise productivity was flat or even fell marginally in 1999. Sales barely grew. But ... BUT ... we bought inventory to just shy of our plan ... and we didn't allow the customer (especially unproductive customers) to see the garbage that wasn't selling. In fact, we took 3,000,000 in 200 page circulation and 3,000,000 in 64 page prospect catalog circulation and converted it into 1,500,000 in 180 page circulation and 5,000,000 in 64 page prospect circulation (I don't remember the exact numbers, so don't hold me to this) ... and that change in "productivity mix" caused us to be a lot more profitable on comparable sales volume. Tack on a $3 "handling fee" (which you could never get away with in 2019 ... but in 1999 that added a lot of pure profit) and we had a record year for profit in 1999 ... and the Merchants and Marketers were happy because the productivity gains they "signed up for" were realized. That's business, folks. Business isn't "4 Tips For Success". It's identifying ways to navigate various factions while still doing what is right for the company. You have it in your to be clever as well. Use your creativity in a positive manner! A new CEO is hired because a brand isn't performing well. The new CEO brings in a new Merchandising leader. The new Merchandising leader "hates" what has been sold the past few years. The new Merchandising leader discontinues or de-emphasizes the stuff sold the past few years. The new Merchandising leader introduces merch that is "brand appropriate" for the new direction prescribed by Leadership. Invariably, new merchandise doesn't perform to expectations. Because the existing assortment was largely discontinued, there is now a merchandising hole. New merchandise (weak) becomes Existing merchandise (which by definition is now weak because the new stuff didn't work well and better existing merchandise was discontinued). The brand suffers a multi-year hangover. There's an art to transitioning your merchandising strategy. You must hang on to the old winners, even if you don't like 'em, until you have enough winning new merchandise that links to winning existing merchandise. I first did this analysis at Nordstrom back in 2003. One of my analysts and I created linkages between Merchandise Categories. The hypothesis was simple ... do one or two key Merchandise Categories fuel growth in other Merchandise Categories? Are there Linkages between Merchandise Categories that help us understand the role each category plays in the merchandising ecosystem? The answer was a clear YES!! Way back in the day at Nordstrom, Cosmetics and Womens Shoes attracted prospects into the store. If the customer bought from one of those two categories, the customer then moved deeper into the ecosystem, buying Accessories or Womens Apparel. In other words, Accessories and Womens Apparel were "linked" to Cosmetics and Womens Shoes. Well, guess what happened to Womens Apparel if we messed up Cosmetics? Because Womens Apparel was "linked" to Cosmetics, Cosmetics played a "double role" ... it had to perform well to thrive, but it also had to feed customers to Womens Apparel (and Accessories). Once you understand what your "linkages" are, you know how to merchandise landing pages, your home page, your email campaigns, and for those of you with print you know how to merchandise your catalog. That's frequently how calls begin. But that's frequently not how the analysis ends. One of the first things I do is measure merchandise productivity for new items and for existing items. If you see this happening, you might have a marketing problem, sure, but you without a doubt have a merchandising problem that spills over into marketing. New Merchandise This Year = $30.00, Last Year = $36.00, Comp = -17%. Existing Merchandise This Year = $43.00, Last Year = $41.00, Comp = +5%. Total Brand This Year = $73.00, Last Year = $77.00, Comp = -5%. New Merchandise performed 17% worse than last year. Existing Merchandise performed 5% better than last year. The Total Brand performed 5% worse than last year. We just diagnosed a merchandising problem, and we diagnosed that new merchandise is a problem. Could there be a marketing problem? Sure. Go look at new + reactivated buyers and see if you observe a problem. But the first thing to do is dig into merchandising data, because in this case your merchants created a problem, and new merchandise becomes winning merchandise, meaning this problem is going to spill over into the next twelve months. Our first instinct is that marketing messed up ... we'd like to think that because it's easier to fix marketing problems. Our first instinct should be merchandise-centric. Go figure out what we did that caused customers to buy less.